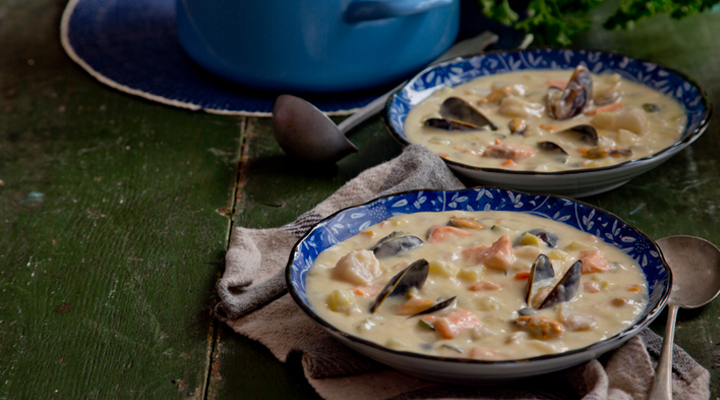 When making good chowder, it's all about the freshness of the fish. Remember, no skin, no bones, no fear! Place the mussels in a medium-sized pot with chopped garlic and a little fish stock. Cook for 3 minutes, until all the mussels have opened (discard any that have not). Strain and set the cooking liquid aside and remove the mussels from their shells. Melt the butter in a medium-sized pot, then add all the chopped vegetables and cook for about 10 minutes, until soft. Add the flour and cook it out for 2 minutes. Add the rest of the fish stock, the cream and the cooking liquid from the mussels. Bring to the boil, then reduce to a summer and add the chopped raw fish and the cooked mussels out the shell. Season with salt and white pepper and cook just until the potatoes and fish are cooked through. Ladle the chowder into four bowls and finish with the chopped fresh parsley. Serve with crusty bread on the side.